After importing Hero pens from China for a number of years in the late '90s, I thought I'd try Shanghai's 2nd-largest pen manufacturer, which was Wing Sung, which had also been around for decades. Hero subsequently purchased the company but now it appears that it's no longer a separate brand. 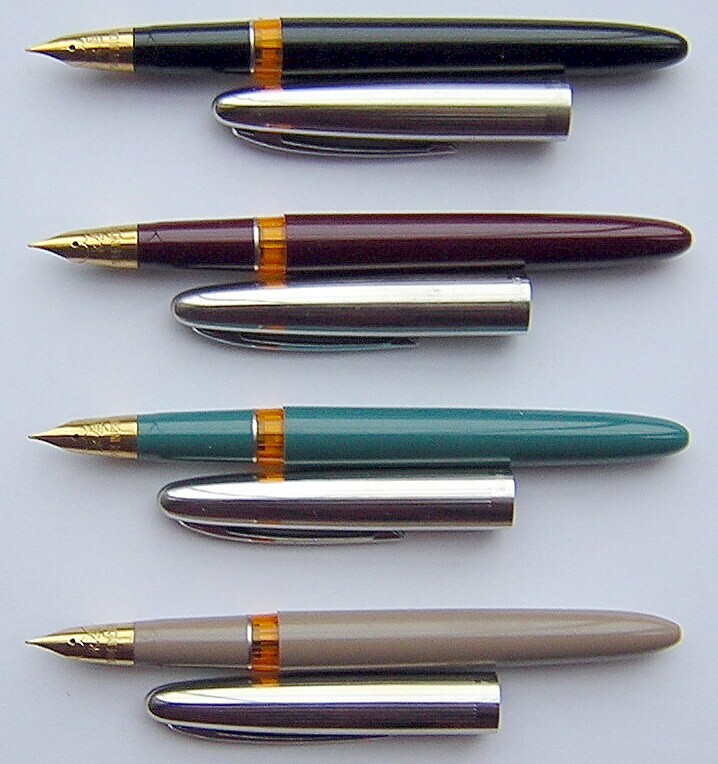 While Hero has designed quite a few pens based on earlier Parker models, the Wing Sung pens were more of an homage to Sheaffer! Most notable is the use of a Triumph-style wrap-around, conical nib. The Wing Sung pens offered here are NOS (new, old stock) and so are consequently a bit shop-worn (meaning they might need a bit of polishing, but at this price, are a terrific value). "Hi Norman, the pens and the lovely pen pouch have emerged from their "black hole" (Danish customs) today. Thank you, they are great writers - especially the Wing Sung 233, which combines an XF line with a bit of response, almost "flex" - I can imagine how a Triumph nib must have been, with this clone. Pity neither is made anymore...Thanks for some lovely pens and a Happy easter to you and yours." "Yay! The pen arrived today. Thanks so much for the fast shipping -- the closest thing to instant gratification one can get when there aren't any fountain pen stores to visit near by. And the pen is lovely. It writes beautifully, too. I am constantly surprised at how good these Chinese pens are. How can those manufacturers get these nibs so smooth at such a low price point? 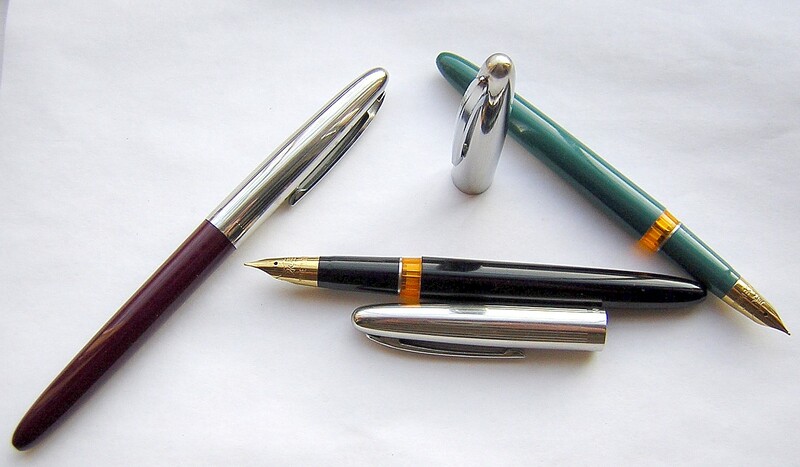 There are other pen manufacturers who could use some lessons, I think...Thanks again for your wonderful service." "Hello your Nibs, the two pens I ordered probably came in last week but as I was traveling, I could only pick them up yesterday. Wow, indeed I am very happy with both of them. As you said, very different from the Wing Sung, and different from each other, but I find I already like them all. The Wing Sung is a stay-at-home these days (my purse was getting so heavy with all the favorites I carried, I made a radical change and removed about ten) but it's within easy reach. The Rocket is staying in my purse though. What a nice little piece of writing technology. I have something with small pens that are still heavy enough to write well with. The Plasma is another story. It's one of the larger pens I have, but what a joy to write with. And beautiful. "Dear Norman: My order arrived Friday. As usual, the fountain pens and bottled ink were well packed and arrived safe and sound. Also, your personal, sealed note is always a treat. After flushing the fountain pens with a light solution of soap and water (as per your suggestion) I dipped the nibs in ink and gave the pens a short "test drive." Both pen wrote smoothly without skip or effort. Your inspection and "tuning" of the nibs really adds value to an already great pen purchase deal. Keep up the good work Norman. You make it possible for people, like me, who have a large love of fountain pens and a very small budget, to own and enjoy some very nice writing fountain pens without having to get a third job to pay for them. Good luck and much continued success with His Nibs.com." "Hi Norman: The Wing Sung arrived in good order. I dip-tested it and it writes very nicely, even to someone who's more accustomed to a medium nib. The color is wonderful, and is a perfect match for the model 730 I acquired a few months ago, which came from the seller's mother's estate and is 30 years old (came in the original box, too). I'm becoming a fan of the modern Chinese pen, as I think it offers great value for the price. I'll be visiting your web site again to see some of your others goodies. The note you included was a nice touch! Thanks. It's the first correspondence I've ever received with a seal affixed. And I finally was able to refold it. You must do Origami! This whole transaction has been a pleasure. A friend in the Netherlands cued me in your direction, since we share a common interest in older Wing Sung pens." 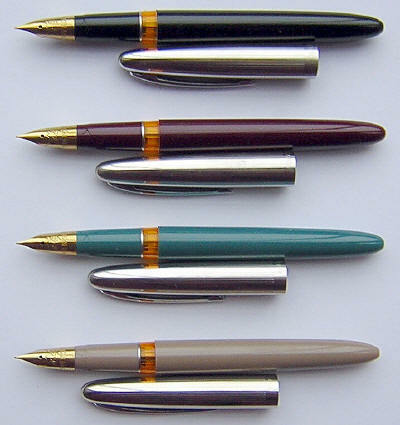 "Norm: I have received the pens yesterday in good condition. Followed your cleaning recommendation, which was very helpful. Ink one of the pens this morning. All I can say is this product is an incredible value, along with your QC before shipment. Thank you for your service. The pen writes flawlessly and is reasonable in price. Well done." "The Jinhao is beautiful and I can't believe the quality of this pen and for such a modest price. It looks great, it feels great and is packaged like an expensive pen. I recently bought the Conklin Nozac (the reissue) and there is no comparison, in my opinion. But the Wing Sung is a delight and will be the pen most used. So once again thank you." "Hello Norman. I ordered the Wing Sung 233 FP and a few other pens from you a few weeks ago. I love fine point and extra fine point fountain pens and I'm amazed how smooth the Wing Sung 233 writes. I've used it everyday since received. I have some costlier fountain pens in my collection and I can honestly say that I, based purely upon how the Wing Sung writes, I prefer this pen over some of the more expensive fountain pens in my collection." "The Wing Sung 233s are sleek, compact, and good writers at a good price. I got one for myself and one for my son because he wanted a refillable fountain, pen and I thought the vacuum filler complemented the pen's historic styling." "Norman, I received my order of the Wing Sung 233 on Saturday last. First ink was a true joy, Filled with Parker Quink Black with no problem and flow was immediate. On this pen I would have to say that the line is closer to fine than medium though. There is very little tooth to the nib and it almost glides across the page. Fit, finish and feel are all well above average. A definite keeper and I believe that it will have a prominent place in my rotation." "Wow. The light teal Wing Sung arrived today. Much thanks. Its a great pen. Amazing how a pen with a nib that fine can be that smooth. You are truly a god among pen sellers! ;-) I also used it to write a short note which will go out in the snailmail tomorrow. I think everyone should have at least one Wing Sung. It should be mandatory. Especially people who think they may not like extra fine nibs. A Wing Sung, with HISNIBS QC, is an amazing pen. Again thanks." "I've been writing with the Wing Sung all evening---oh, my! This is even better than the Hero 100. (And to think that for months I scoffed at the very idea of these "cheap" Chinese pens!) Though it feels almost too light, the slightly longer length gives ideal control and handling. It writes like a smooth and wet medium nib (with Noodler's Navy Blue ink), though I was fearing that it would lay a dry extra fine type of line. Well, this will easily become my daily use pen. You can expect me to order more of these very soon! 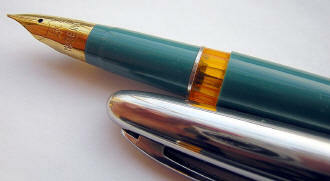 I love the torpedo/submarine shape---very reminiscent, as you say, of old Sheaffer snorkels." "Very many thanks for the Wing Sung 233 fountain pen which arrived today. Even with the cost of postage to the UK, this pen is still ridiculously cheap - and it writes superbly." Removing the slip cap -- which securely snaps back into place -- displays the wrap-around, conical nib. It's gold-plated steel, and equates to a western fine. Like most nibs designed for the Asian market, it's designed to be firm for writing the more intricate Chinese characters. The nib is engraved with the Chinese characters for 'Wing Sung', along with 'Made in China' written in English. Also readily apparent is the ambered ink-vue window, which allows the user to instantly determine when it's time for a refill. Unscrewing the barrel reveals the pump-style filler, for use with bottled ink.